Can sitting or standing hurt a young baby’s bones? Little babies love to master new things. And they have fun doing it, too—their eyes sparkle when they learn to stand in your lap, or when they sit up with a little help to see the whole world. When they’re lying down on the floor or their bed they can only see the ceiling. Where’s the fun in that? Their little minds and bodies are made to grow and develop and try new things. Spending time on their tummies helps babies develop muscles in the front of their chests, and helps practice the coordination to lift their heads and look around. Time sitting up exercises different muscles, too. And bones themselves grow and develop based on the stresses and loads that they feel—so, yes, standing up is a good thing to help babies grow stronger and more confident of their skills. A few caveats – keep a little common sense in mind. Those gizmos that help babies sit up are fine, but not if you put them on top of a table or counter. They can still topple out of them, so never use them on a raised surface. 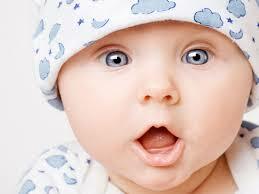 Also, a baby has to be able to hold his or her head up unsupported to stay in an upright position. Is there a limit to how long babies should try these new positions? Sure – let the babies tell you. If it starts to hurt, they’ll get upset, and that’s when you’ll pick them up or move them or try a new activity. If bones are being “damaged” by the stress of a new activity, they’ll hurt, and you’ll know it. That’s why people feel pain when they should stop doing something. Babies are very good at telling you when something hurts. They’re also very good at telling you when they’re happy. So help your baby learn new things and try new ways of standing, sitting, and getting around. Have fun! From my point of view, how many words a 13 month old is using really isn’t a useful marker of how well the child is developing. Some normal 13 month olds have 4 words, some fewer; some have no words at all. There’s a lot of variability there, and concentrating on word count at this age can create a lot of unnecessary worry. Use gestures like waving or nodding. Point to things he wants, or point to things he wants you to look at. Look at things you point at. Show off—that is, do cute things, then look to make sure you’re paying attention. Combine sounds with a melodic quality, similar to speech. Even if words don’t make sense, the overall “sound” of his babbling should sound like a monologue, with pitch and speed changes and pauses. The easiest “milestones” to talk about and compare between children are things like when they start walking, or how many words they say at a certain age. However, the subtle things like the ones I’ve listed are far more important, and offer far more insight into how a child is developing. It’s true that at least mild speech delays seem to be more common in twins—some believe they have each other to “talk to,” and don’t need to learn Mommy’s language! I’m not sure that’s necessarily true, but you should certainly see if your children are in the usual range of speech skills for their age. She’s too young! Is puberty starting early? I saw a ten year old girl in fifth grade for a check up this week. Her mom mentioned that she had started to develop breasts about a year ago. When I started talking about the girl’s first period, mom’s jaw dropped open. Mom had been 13 when she started—could her daughter be about to have her first period in elementary school? Why? A girl’s puberty starts with breast development, which historically was thought to be normal from age 9 to 14. About 2 years after the beginnings of breast development, a girl can expect her first menstrual period. Two years after that, she’ll have reached her adult height and will stop growing taller. This signals the end of puberty. Boys begin puberty about a year or two after girls, with a normal range of 10-17 years. Boy puberty begins with an increased testicle size. Boys continue to grow for about 6 years after the beginning of puberty—meaning for two years longer than girls. This accounts for most of the height difference between adult men and women. There are some very normal minor variations in puberty. During the prepubertal years, many girls will develop a small amount of pubic hair, which does not progress. As long as other findings of puberty don’t occur, the appearance of pubic hair in a young girl is not a cause for alarm. Likewise, many boys going through normal puberty will have a small amount of breast tissue develop. This can occur on one or both sides, and though embarrassing for some boys it does not progress and doesn’t mean anything is going on. I tell the boys not to worry, they are not going to grow breasts. Boy who are self-conscious should choose to play for the shirts, not the skins. What about early puberty? Many studies have documented that in the developed world, girls are indeed starting earlier. Also, we now appreciate that there are differences in normal puberty among girls from different races. Health authorities now recommend that for Caucasian girls, puberty should be considered early only if it begins before age 8, while African-American girls may begin at age 7. Some authors consider even ages 6 or 7 to be normal. No similar decrease in the age of starting puberty has occurred in boys. Why has puberty become earlier in girls? The best studies show that the age that puberty begins is most closely correlated with improved nutrition and with body fat. Girls from societies with good nutrition begin puberty earlier. Also, as more girls become overweight, the increased total body fat affects the metabolism of female hormones, leading to a decreased age of puberty. Conversely, girls who are very muscular and lean from sports participation tend to have a delayed puberty. There are several other environmental exposures that parents sometimes wonder about. A lab-manufactured copy of a normal cow hormone, called BST, is injected into many dairy cows to increase their milk supply. Some people believe that this hormone in milk affects the age of puberty. However, milk produced by BST-treated cows does not contain more BST than milk from untreated cows. Most convincingly, developed countries that have restricted the use of BST (including Canada and countries in the European Union) have seen the same drop in the age of puberty as in the United States, where approximately one third of dairy cows are BST-treated. So whether or not they’re drinking milk from BST-treated cows, girls are starting puberty earlier. Industrial pollutants including PCBs may act as “endocrine disrupters,” influencing the timing of puberty. Although buying organic produce may decrease your family’s exposures to insecticides, there really isn’t any evidence that it will decrease the exposures to industrial contaminants or allow your daughter’s puberty to begin later. In 2007, cases were reported of boys developing breast tissue after regular application of skin creams containing lavender oil or tea tree oil. These products contain estrogen-like compounds that are absorbed through the skin. Though no cases of early puberty in girls have been linked to these herbal products, they do have a potent hormonal effect, and girls experiencing early puberty should tell their physicians about all medicines and herbal products that they use. In boys, early puberty has also been caused by inadvertent application of their father’s prescription testosterone creams. Fathers who use this cream need to wash their hands! Why should we identify children with early puberty? Perhaps the most important consequence of early puberty is decreased adult height. Children who start early will end early, and may have fewer years in which to grow. Since pre-pubertal children grow about two inches a year, a girl who begins puberty four years early may end up eight inches shorter than she would have if she had waited. Also, at least in girls, early puberty can be associated with poor self-image, social isolation, and depression. Though there is a wide range of normal ages at which puberty occurs, the normal age for girls to begin puberty has decreased. If your child is having physical changes of puberty early, a complete physical examination should be performed by your pediatrician. This should always include careful measurements of height and weight. An isolated finding of early pubic hair itself may not be worrisome, but a six year old girl who has breast development, pubic hair, and a big jump in her height is certainly going through full-fledged puberty early. True early puberty should be referred to a pediatric endocrine specialist for further evaluation.